The Publisher Says: The events of that small-town summer forever alter David Hayden's view of his family: his self-effacing father, a sheriff who never wears his badge; his clear sighted mother; his uncle, a charming war hero and respected doctor; and the Hayden's lively, statuesque Sioux housekeeper, Marie Little Soldier, whose revelations are at the heart of the story. It is a tale of love and courage, of power abused, and of the terrible choice between family loyalty and justice. My Review: Another one I'd give six stars to if I could. This book has a deeply personal connection to me and my life. I have given many copies of this book away, because of its role in helping me through a horrible emotional crisis of a year. I was given heart, comfort, and guidance by this work of fiction, such as no corporeal person could have given me. But to consider this as a book, a novel written for an audience by a writer, is to appreciate anew the benefits of craftsmanship and the ungovernable lightning of talent. There are very few books I can give the accolade of "I wouldn't change a single thing" to, and this is one of them. Not one word out of place, not one simile or metaphor ill-used, unused, or overused, nothing could be added without compromising the beauty of the book, and nothing need be removed to clear aside clutter. If brevity is the soul of wit, it is also the soul of wisdom, and this book is wise, so wise, to its child narrator's painful coming to adulthood. It's also wise to the nature of love as lived from day to day, and how it so often can curdle into acceptance of what one cannot change...but should, or should always strive to, because some things are simply, inarguably, Right. As a meditation on one's remembered past, this is a crystal clear and unsparing récit; as a story, it's so simple as to be mindless, except that it's mindful of the role of unadorned narrative in making the world a better place. I would like to know the characters in this novel, really know them, sit in their kitchens and listen to their stories and drink their vile percolated coffee. I loved each of them, yes even the one whose bad deeds set the story in motion, loved them for being real and nuanced and far more vulnerable than most of the real people I know. I can't recommend this book to you, because it's very strong meat; I can encourage you to read it if you care for justice, the horrible cost of it and the terrifying price it exacts from those it visits; but you will come away from it changed, as I was, possibly for the better but changed. Don't ever ask questions you don't want the answers to...and this book answers some very, very nasty questions with grace and beauty and forgiveness. 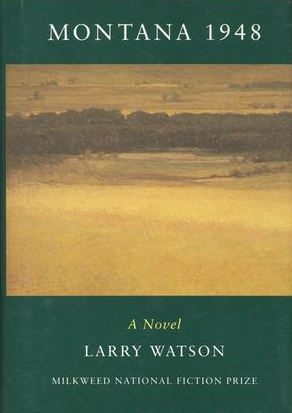 The Publisher Says: Larry Watson's bestselling novel Montana 1948 was acclaimed as "a work of art" (Susan Petro, San Francisco Chronicle), a prize-winning evocation of a time, a place, and a family. Now Watson returns to Montana 1948's vast landscape with a stunning prequel that illuminates the Hayden clan's early years and the circumstances that led to the events of Montana 1948. In Montana, the Hayden name is law. For the Hayden boys, Wesley and Frank, their legacy carries an aura of privilege and power that doesn't stop at the Montana border, even when an ill-fated hunting trip makes them temporary outlaws. But what it means to bear the name is something each generation must discover for itself. From Julian, the hard-bitten and blustery patriarch, to Gail, Sheriff Wesley Hayden's spirited wife and moral compass, Larry Watson gives breath and blood to a remarkable family's struggles and rewards, and opens an evocative window on the very heart of the American West. My Review: A collection of previously published short pieces, Justice tells the backstory of the Haydens of Bentrock, Montana, the family at the center of Watson's one bestselling novel Montana 1948. We meet patriarch Julian Hayden in 1899, barely dry behind the ears and ready to take on the world; his shy, retiring, high-strung wife Enid on the day she married him; his two sons on the day childhood ended for both, in which the seeds of Montana 1948 are explicitly sown; Wesley's short, abortive run for freedom from the weight of expectations sparks at a terrible family Thanksgiving dinner; Julian's and Wesley's deputy and general sad-sack, Len McAuley, comes in from the pointlessness of secondary characterization in unexpected and poignant ways; and then the marriage and parenthood of North Dakotan steel magnolia Gail and Wesley, a life started in, and blighted by, the shadows of the Hayden family legacy. This is decidedly not Montana 1948. It's perfectly good read on its own, actually, just as character sketches of a family and its effects on the world at large, and its costs to the members thereof. I can't complain about anything here, because Dr. Watson is a prose stylist whose direct, pared down artistry is very appealing to me. I can't urge all and sundry to rush out and buy a copy, either, because the book is a collection of short stories with all the cultural freight implicit in that description. Tastes and hints and pieces are the stuff of short stories, and that is both a strength and a weakness. Here, it's perfect, because the novel they prequelize (a rather lumpish and ungainly neologism, but "prefigure" is so stuffily snooty) is in itself a marvel of tight, concise storytelling that leaves acres of room to wonder about the people in it. But on its own, under its own steam, it's very good but not great. Good writing, interesting characters, but nothing...well, nothing to launch it to that next level, say like American Salvage or Everything Ravaged, Everything Burned. Still. You have definitely done worse by yourself than reading these seven stories. I'm glad I finally made room for them on the nightstand. Recommended.